A few years back we had a friend come stay with us for the first time. While setting up the guest room I thought it would be a nice touch to put a few individually wrapped cookies and a bottle of water in the little basket on the nightstand. I decided to go with one of my more unique cookies, the White Chocolate Cherry Chunk, as they tend to make a good first impression and that was what I was going for. When the weekend was over and I was putting the room back together I couldn’t help but smile when I noticed that all of the cookies had been eaten. It wasn’t until months later that my friend confessed that while he did enjoy the cookies, he almost hadn’t eaten them. He was a cookie purist, and in his opinion, there was nothing like the delicious simplicity of a really good chocolate chip cookie. He’s right. Who among us can resist a warm, buttery chocolate chip cookie right out of the oven? With a cold glass of milk, there may be nothing more satisfying or comforting. Which is why today, we should all give thanks to Ruth Wakefield. Ruth Graves Wakefield, together with her husband, established the Toll House Inn in 1930. Ruth, a dietitian, prepared the recipes for the meals served to the guests at the Inn and became quite famous with the locals for her desserts. One of her favorite recipes was for Butter Drop Do cookies, a recipe that called for the use of baker’s chocolate. One day Ruth found herself without baker’s chocolate and decided to substitute a semi-sweet chocolate bar (a gift from Andrew Nestle from Nestle Chocolate Company) which she cut up into bits. However, unlike the baker’s chocolate, the chopped up chocolate bar did not melt completely, the small pieces only softened. 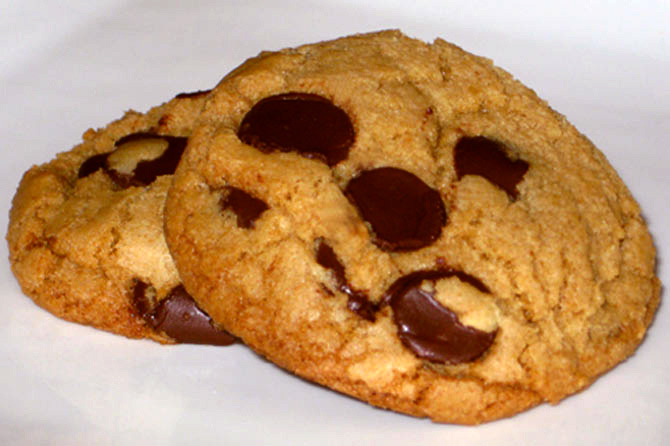 As the Toll House chocolate chip cookie recipe became popular, sales of the Nestlé’s semi-sweet chocolate bar increased. Andrew Nestle and Ruth Wakefield struck a deal. Nestle would print the Toll House Cookie recipe on its packaging and Ruth Wakefield would have a lifetime supply of Nestle chocolate. Today, when customers call and ask my opinion as to what kind of cookies they should order, whether for a gift or a platter, I make it a point of suggesting some of our more unique flavors, but always advise that they include at least a dozen of our Ultimate Chocolate Chip Cookies. That way, even the purists are happy.